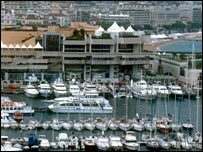 The waterfront at Cannes - once a year haunt of the movie elite - is one of the world's holiday destinations of choice. And each year the resort in the South of France is also home to Mipim, a major gathering of international property developers, just five days before the famous film festival. It was seen as an ideal event where representatives from the South East Development Agency (Seeda) could court property developers in a quest to build an international conference centre at Ashford in Kent. The agency argues that major developers are more likely to flock to their trade's annual bash in Cannes than head for Ashford. At face value, if schmoozing with international property developers in waterfront cafes or champagne parties on yachts secures lucrative business, the £190k to send 13 people to the event might be seen as money well spent. However, no centre has been built so far and BBC File On 4 has yet to find any firm proposals for a centre apart from a Seeda chief executive's report dating back to 2003 mentioning potential developers. Paul Lovejoy, Seeda's Executive Director of Strategy, said it is essential the agency attends such a gathering. "We need to engage the property developers where they meet," said Mr Lovejoy. He added: "The level of hospitality is appropriate to the occasion." For Liberal Democrat MP Norman Baker, questions over the size of Seeda's presence at this gathering is symptomatic of his concern, that the taxpayer is not getting value for money from Regional Development Agencies (RDAs). While agreeing that foreign travel and conferences can win business he added: "Thirteen Seeda staff, do we need that many people to attend? It was described as an endless run of champagne on yachts. It costs a vast amount of public money and it is not clear what the gain is for that particular event." Using a Freedom of Information (FoI) request, he found that Seeda's chairman James Brathwaite had a taxi and executive car bill of £51,489 for a year in his part time post. "I don't know if he is living in a taxi but it is difficult to understand how he's run up a bill of that nature." "Fifty thousand on taxis suggest to me that Seeda, largely unaccountable, may not have the rigour to make sure public money is properly spent in the same way as local councils and MPs." Seeda said Mr Brathwaite travels more than 50,000 miles a year in a large and diverse region. But Mr Brathwaite is not the only senior figure from an RDA under scrutiny for his transport costs. The 2005 Rugby League Challenge Cup Final saw Hull record a shock 25-24 points victory over Super League champions Leeds. But a bigger shock might be the cost of a ride home from the final for Steven Broomhead, chief executive of the North West Regional Development Agency (NWDA). File On 4 has discovered Mr Broomhead, who is also vice chairman of Warrington Wolves Rugby League Club, got a chauffeur-driven trip from the Millennium Stadium back to the North West for himself and a friend at the taxpayer's expense. The owner of an executive car business confirmed that one of his drivers took Mr Broomhead and a friend to the match from their Cardiff hotel, and after the game drove hundreds of miles dropping the friend off at Warrington, before taking the NWDA's boss to his home in Preston, Lancashire. The following year Mr Broomhead, who has a company car, received a similar chauffer-driven ride when the final was held at Twickenham in London. Mr Broomhead was unavailable for comment but the NWDA's head of legal services, Steven Zdolyny, said the agency's boss was invited to the games in an official capacity, and, "if he attends a function in that capacity, he can choose the form of transport to be used." Critics such as Mr Baker believe it is difficult to call quangos such as RDAs to account, either for the results they deliver or their use of taxpayer's money. 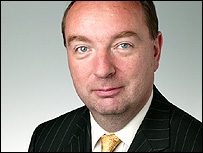 Stephen Radley, chief economist of The Engineering Employers Federation, said it is not clear whether the agencies are hitting their targets nor whether these targets are meaningful. "There is an element of scrutiny but a lot seems to be self reporting," he said. But Mr Tom Riordan, an RDA chief executive who speaks on behalf of all nine of the English authorities, said the agencies are accountable to plenty of bodies. "We are accountable to ministers via parliament, the National Audit Office carries out an external audit as well as scrutiny from Regional Assemblies," he said. But observers such as Mr Baker believe that, with the forthcoming dissolution of Regional Assemblies, there will be even less local scrutiny of the agencies. The MP introduced a Private Member's Bill last month, which would make public servants such as RDA chief executives as accountable for their expenses as councillors or MPs. "This shadowy world of unelected bodies needs to be more regulated......it needs more accountability not less." Hear the full story on BBC Radio 4: File On 4 Tuesday 26 February 2008 at 2000 GMT, repeated Sunday 2 March at 1700 GMT or online at the File on 4 website.